Google is now letting anyone use its new auto-captioning feature for YouTube videos. Back in November, YouTube released a robo-transcription option for just a limited number of educational channels, saying it would expand the tool to more videos in the future. Well, the future is now and has begun rolling out across the entire website1. YouTube auto-captioning uses algorithms found in Google's voice search technology for mobiles to automatically generate video captions, according to Google. The first thing you'll notice is that, while useful, it ain't magic. Unless the video has a very clear audio track, there will be some hiccups in the voice-to-text translation. 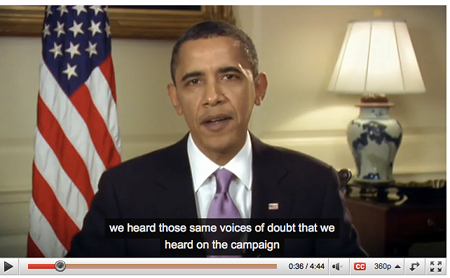 Automatic captions for a 14-year-old's video diary: nigh incomprehensible. US President Obama's weekly address to the nation: works pretty nice. Video owners also have the option of downloading the auto-generated transcription, touch them up, and then upload the new improved version. Content owners can select a "request processing" option for existing videos that should hasten the availability of caption tracks. However, Google warns it may take a few days for the speech recognition track to become available. Google said it plans to broaden the feature to include more languages going forward, although it's currently available only for videos where English is spoken. In a Thursday blog post Google said that it hopes the auto-transcription service will help make YouTube more accessible to the hearing-impaired as well as those learning English as a second language. Adding transcription tracks to YouTube search could also make finding specific videos — like that one with the dog riding the skateboard — easier for viewers to locate. Assuming someone with a certain clarity of diction says within the video itself something to the effect of: "Oh wow, look at that dog riding a skateboard." Now who's rolling their eyes at the guy who always states the obvious? 1 We should note that an instant transcription service has always been available at The Register , by simply selecting "print" on your web browser option menu.